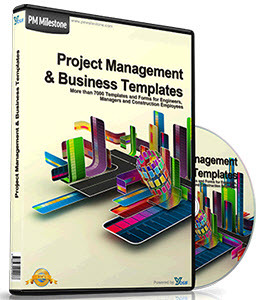 Microsoft Project includes a variety of standard views that present task, resource, and assignment information. When these standard views don't meet your needs, you can customize their content or create new views that are more suitable. In single pane views, you can specify which view, table, group, and filter to apply when the view appears; and for combination views, you can change which views appear in the top and bottom pane. 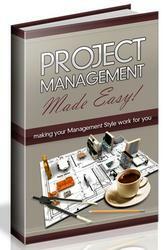 For more information about working with the built-in Microsoft Project views, see "Using Views" on page 95. 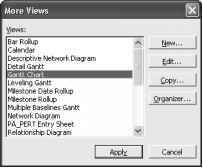 Note Even though views such as the Gantt Chart and Task Usage view are made up of two sides on the left and right, they're still considered single pane views. In the More Views dialog box, click the view's name in the Views list (see Figure 25-1). Figure 25-1. You can edit an existing view, copy an existing view, or create a completely new view. Click the Edit button. 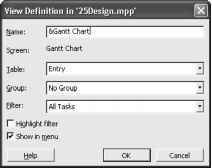 The View Definition dialog box appears (see Figure 25-2). If you want to create a new view that is similar to the selected view, click the Copy button and type a new name in the Name box. If you plan to use customized tables, groups, or filters in a view, you must create those elements before you use them in a customized view. You must also create customized single pane views before you can include them in a combination view. Figure 25-2. You choose a table, group, and filter when you customize a single pane view. 4 In the Table box, click the table that you want to appear in the customized view. 5 In the Group box, click the group that you want to use. 6 In the Filter box, click the filter that you want to apply. 7 If you want to highlight filtered tasks, select the Highlight Filter check box.